Our Caribbean Adventure, Part 6: Sailing From Sint. Maarten to Antiqua, the Long Way Around | Have More Fun. Get Boativated! Sint. Maarten to Antiqua, The Long Way Around. 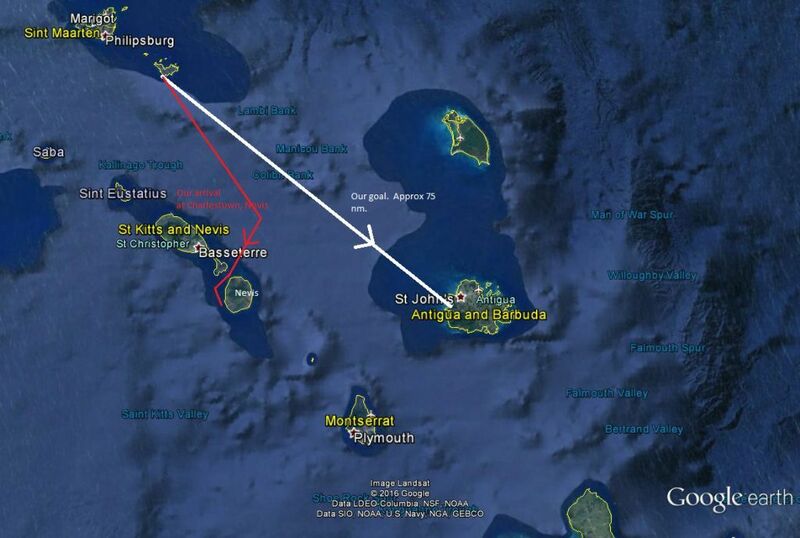 For logistical reasons, we chose to leave the Island of St. Martin from the Dutch Port of Phillipsburg. That was a mistake for a number of reasons (customs and immigration and the cost of the marina mainly) but we did enjoy our brief stay in the tourist port and we were outside the logistical hassles of the drawbridge at Simpson Bay, and that crowded and exposed anchorage so there were some positive aspects. 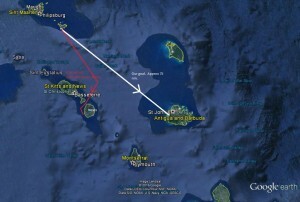 We left in the mid morning, intending to stop again at St. Barts. Anse Colombier anchorage on the north west corner of that island was highly recommended so we thought of anchoring there. But after an uneventful sail into moderate winds and seas we arrived to find it crowded and uninviting. Since there is no customs and immigration office there we would not be able to go ashore so after a few moments consideration we decided to proceed. We arrived at Gustavia in the early afternoon and found it windy, lumpy, and extremely crowded. Anchored yachts big and small were packed together, but swinging in an orderly fashion. We called the harbor master to check on mooring availability and were advised to anchor, then come by dinghy to inspect the only vacant mooring. We decided to combine that with a visit to the customs and immigration office. We found the vacant mooring, a bow and stern combination of two buoys, packed tightly with very little room to maneuver port or starboard. I thought we could probably get the bow tied but leaving, with the blustery cross wind would be difficult to impossible without the high risk of crashing into the other boats. So we went to the port office and completed the entry on the computer. They allow one visit for entry and exit the next day so that fit our schedule nicely. I was unimpressed with Gustavia but my wife and our friends found it more acceptable. I am not one to “browse” in overpriced shops at trinkets and items with high fashion labels with prices in the thousands of dollars but everyone else liked the window shopping and the little town was clean and neat. That night at anchor was bumpy and noisy but tolerable. It was our first introduction to the Caribbean cultural aspect of very loud music until the wee hours of the morning. We planned to leave at first light the next day. Three of us woke early, before sun-up, and decided to get started so as to have plenty of time to make it to Antigua. Our goal was the marina at Jolly Harbour. Distance, about 75 nm. We figured a 12 hour trip, with arrival in the late afternoon, before sunset. Unfortunately, that was not the result. Our exit from Gustavia harbour was safe, although very dark. The sky began to lighten at about 5;30 am. I and my wife Mary and our friend Kathleen snacked for breakfast and we motored out of the harbor and began motor sailing into a stiff headwind. Kathleen’s husband John stayed in the v-berth for some extra sleep. He found it easier to sleep to the big diesel boom than to the reggae rap “music”. But by the time he got up, we were in rough seas and he was becoming sea-sick. Despite thousands of hours as a commercial airline pilot, the rough, confused seas, did not suit him at all. To make headway toward our goal we needed to motor sail with the main and genoa partially rolled up. 8′-10′ seas kept us pitching forward, but the boat did not pound, primarily due to our low speed, about 4 knots over the bottom. By lunch time, everyone was becoming edgy and impatient. I knew our Antiqua destination was doubtful. After about nine hours of rough going I offered the crew a choice. Another 7-10 hours of slop and arrival in Antigua well after dark, or a course change to Charlestown, Nevis and some nice late afternoon sailing in the lee of the island. That decision, needless to say, was not difficult. So we fell off in the winds and seas and got a more comfortable ride. John perked up as the boat settled down and everyone got cheerful at the prospect of a much nicer 3 -4 hour finish to the passage. We arrived at Charlestown, fully in the lee of the Island and its mountain, with 8-10 empty moorings off a beautiful beach. We had a very nice evening, dinner, and all slept well for over 10 hours. Another confirmation of the old adage. “Never sail to a schedule”. Nevis is a beautiful island, with friendly people, accommodating and helpful government officials, clean streets, nice shops, and far less of the racist attitude toward white tourists that is so often present in the Caribbean islands. (Be careful at informal restaurants though. Be sure to ask prices before you order. We learned this the hard way.) We stayed two nights and spent a nice few hours taking a taxi tour of the small island. It was beautiful and fun. From the moorings, there is a nice beach with easy landing, a resort with an excellent bar and restaurant friendly to cruisers, and free wi-fi. Nevis is part of the same country as St. Kitts, but much more laid back. We felt very safe and secure tied to one of the government moorings. Of all the islands in the Caribbean we have visited over the last three years, Nevis is the only one I would ch oose to live on. From Nevis, we proceeded to Montserrat and then further south to Guadeloupe. Due to the stiff trade winds and high seas we did not visit Antigua until the next year.